The mini-mission continues. But, with a laser backpack. Honestly? Except for a small handful of legitimate chuckles (he's had the clap so many times it's more like applause), this episode felt very predictable. I found myself ahead of the gags, expecting exactly what happens next. And, what was with Cheryl and her damned titanium knitting needles? It was like the writers kept telegraphing a plot point or gag and then neglected to pay it off. So, now we wait 'til next year to see what Archer's "couple of ideas" are for the future of our now-unemployed espionage organization. And, for some reason, I'm really disappointed Milton didn't somehow make it into the finale. They were tungsten! and I was disappointed they wasted such a good setup. It was funny because you knew what was going to happen.... Then an anticlimax. This should have been condensed into one episode, I felt both were stretched too thin. I hope the thoughts involve Trudy Beekman. And no sign of Woodhouse all season. I liked the visual gag of Archer and Pam swimming towards the clot. There had to be a reason their submarine uniforms were white. Has Archer ever worn those particular sunglasses before, the ones he puts on when he says "Well, I actually have some thought into that."? Season 7 teasers. Guess they didn't have time this season to do a big Woodhouse episode(s). Well, the entire 2-parter was an homage to the movie Fantastic Voyage. In that movie, the micronauts wore white uniforms. In the movie, they also swam around outside the craft and zapped stuff with a laser gun. I'm kind of surprised they didn't do a take on the relatively famous scene where the white blood cells wrap themselves around Raquel Welch. That just seemed like a no-brainer for Archer to do, especially with Pam. The weirdest thing about the two-parter is that Archer not once dropped obscure references to the very fact it was a Fantastic Voyage situation. Ordinarily, the references would be machinegunned in. Raquel Welch, absolutely. Archer constantly getting into everyone's face because obviously Lana! 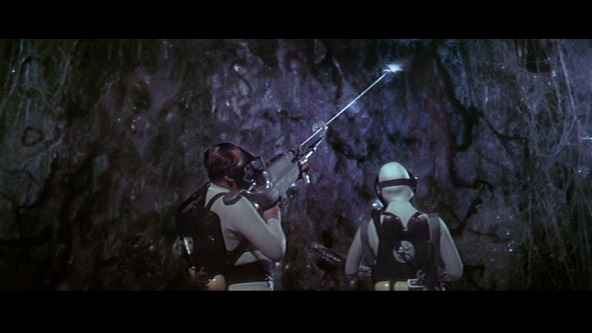 there's a Russian secret agent there to sabotage the mission because OH MY GOD FANTASTIC VOYAGE PEOPLE? ANYONE?! etc. Also riffs to other Fantastic Voyage-alikes, and for that matter Incredible Shrinking Man and so on. DOCTOR: Well did you see Inner Space? WENDELL X: *gasp* Just like in Inner Space! WENDELL X: ...never caught on. DOCTOR: ...where you access his motor functions and adrenal glands, then utilize your superhero abilities to turn Wendell X into an unstoppable fighting machine! XANDER CREWS: ...on that because it is retarded! Wendell! XANDER CREWS: Go kill that baby, buddy. DOCTOR: Now there's a movie I haven't seen. XANDER CREWS: Uhhh, Vera Drake? XANDER CREWS: It's -- for an abortion movie -- pretty funny. XANDER CREWS: All abort! Toot toot! Just finished the season. I thought the finale was predictable as well, especially with Krieger ruining everything. Although honestly he was.. uh.. what's the opposite of a deus ex machina? Like a demon ex machina? Yeah. I thought it was too convenient that he popped up and ruined everything. While his backwards medical knowledge was funny, it didn't make a whole lot of sense given how just two episodes ago he led a surgery to attach a bionic arm. And maybe they're pushing the Krieger clone thing, but the real Krieger would've stolen all the tech before or instead of destroying it all. Plot points aside, it was a pretty entertaining finale when you don't pay attention to that stuff.